It’s not every day you are offered free chocolate. Free chocolate which also happens to be made by hand. Free chocolate which happens to be made by hand by a friend, in tiny batches, not far from you. And freshly. So naturally, I fell off my chair saying YES PLEASE. The bar you see in the picture has actually been nibbled at already – the top part devoured as I couldn’t wait to try it before taking a quick snap. At 50g, it’s a great size for a taster bar. Just enough to be able to really get a feel for it and find out how the flavours play on your palate. And the simple packaging is good too, a nice shiny gold packet with a resealable top. No more fiddling around with bits of foil and paper, trying to fold the packaging over itself to keep it fresh! Right. Onto the important part. The Chocolate. The ingredients list is impressively small and purist, also boasting some muscovado sugar for depth of flavour. How does it look? It is well tempered, with an even, glossy finish and a slightly reddish hue typical of Madagascan cocoa. The design of the mould is nice too, displaying cocoa pods and leaves and a breakaway-piece style. Upon breaking it, the snap is loud, crisp and clean. Just as it should be. 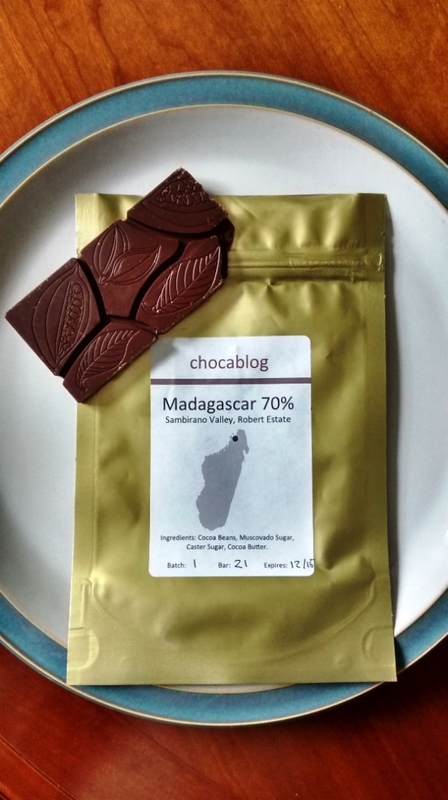 Dom, the chocolate maker (and founder of Chocablog), actually gave me the bar two weeks ago and the aroma and flavour have softened since then. Amazing how freshness is queen, something easy to forget in today’s convenience age of long shelf-life products. It was very intense when I first tried it, fairly sharp acidity, bright and bold, those lovely Madagascan red fruits notes, really special and slightly nutty. Some tannins detectable. Now it’s acquired a little more ‘mellow’, with a rounder flavour and the earthiness is more prominent. The astringency has taken a bit of a back seat, which probably makes it even more agreeable to most palates. There is a good, smooth melt and a lovely long finish, turning a little more nutty and fruity towards the end. This is a chocolate bar well worth seeking out – if you ask Dom nicely, I reckon he’d sell you one of his microbatch bars. He’s even letting you in on his secrets by telling you how he made his chocolate here. This fascinating book winked at me from behind stacks of recipe books at a second hand book stall in my local park this summer. I couldn’t resist, and what a gem it is. It is part cultural history, part travelogue, part literary gastronomy. 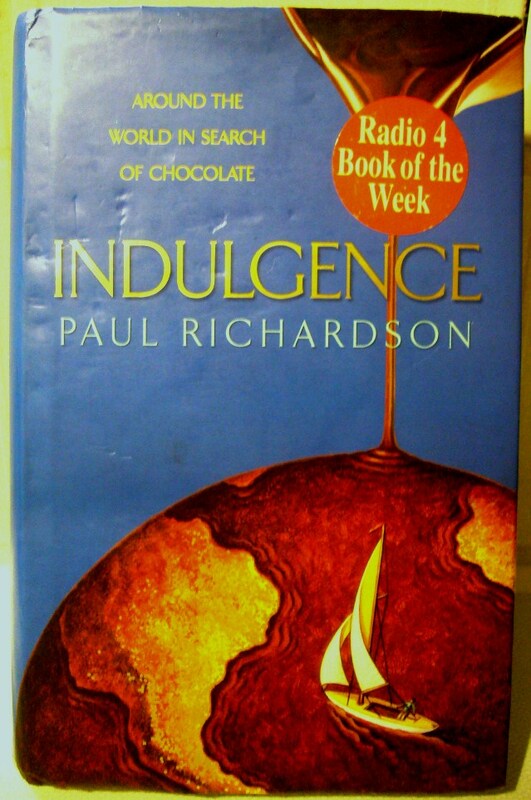 The author, Paul, is drawn to chocolate and journeys to discover more about the magical fruit. It is immediately clear he has done extensive research, which pays off as he feeds his reader captivating tidbits of myth, fact and history. It’s also pretty remarkable how he followed his passion around the world with a dedicated curiosity few can match. Along the way he discovers chocolate’s dark, bloody, and spiritual ancient history, reflecting on the ways culture, values and chocolate uses have changed over the centuries, often coming full circle as we begin to appreciate the true value of good chocolate once again. Paul starts in Mexico, the very source of chocolate – exploring ancient Mayan and Aztec cultures, and the way chocolate was absolutely integral to many aspects of those societies. It was used as currency, for religious rituals (many of which were utterly bloody) and as a wholesome, revitalising drink, but whose use was restricted to the ruling classes. In these first societies to cultivate chocolate, it was consumed mainly as a drink, mixed with spices and prized for its thick foam on top. The author explores the decline of cacao farming, especially as an occupational choice amongst the young, who seek higher paid work in the cities. Next he ventures to the fine chocolate heartlands of Venezuela, with its superior criollo varieties of cacao. It’s fantastic to watch the development of Paul’s palate as he makes new discoveries – tasting very different sorts of cacao and chocolate at various stages of refinement, from different places with different traditions and flavour profiles. He moves into Old Europe – Spain, Italy and France, each of which developed their own chocolate cultures that endure today (Spain’s thick hot chocolate, Italy’s love of chocolate with hazelnuts, France’s serious and prestigious Chocolate Societies). He charts the development of chocolate culture across Europe, as it spreads from royalty to the monasteries, then the upper echelons of society and finally through to the Industrial Age and chocolate for the masses. The last chapter recounts the nostalgia of well-loved British chocolate brands, and the ruthless corporate takeovers which ever dilute the histories and personalities of old favourites. He draws parallels between the bloody rites of ancient Mexican cultures (of which chocolate played an integral role), and the blood on the hands of the global conglomerates mass-producing chocolate today, in the forms of slave labour and backbreaking working conditions. The book ends on an optimistic note, as Paul observes with delight how the sanctity and spiritual qualities of chocolate are starting to be recognised once more (for of course it can induce feelings unlike any other, and it can transport you to another state of mind, an enhanced sense of well-being and contentment). Paul excitedly notes the rise of small scale, high quality artisanal chocolate, made using ethical ingredients, and the return to the rightful respect and reverence for the magical stuff. If you can get your hands on a copy, this book is well worth a read – you will learn a lot and come away with an even deeper passion for the wonderful fruits of the cacao tree. This slim, dainty chocolate bar was brought back all the way from Canada. 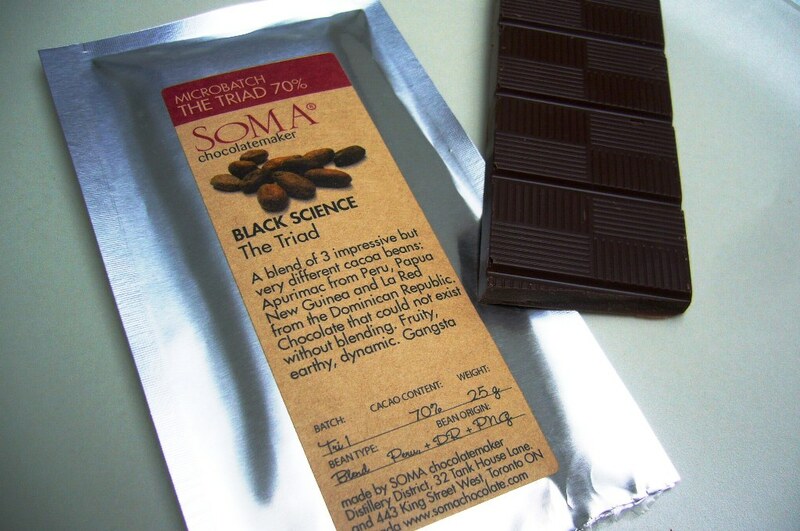 It’s made by Soma, a wonderful artisan chocolate maker based in Toronto. They carefully source their beans, transforming them in microbatches into intoxicating chocolate. The bar I’m lucky enough to have my mitts on is called Black Science: The Triad, and as you can see, it’s a blend of 3 different beans from Peru, Papua New Guinea and the Dominican Republic. The packaging is unusual – you don’t often see chocolate sold in foil pouches like this. I dove right in. This chocolate is a stealthy one – it looks fairly unassuming but boy does it give a punch! Starting with the snap, it’s very clean and breaks loudly with confidence. Next up, the aroma. Very earthy, almost mushroomy, savoury, a bit umami, with a dark brown sugar sweetness. Taste: fruity, with a berry acidity and sharpness reminding me of redcurrants, earthy roundness, jasmine, hint of banana, a woodsyness. Finish – A bit dry in the mouth, savoury aftertaste, long lasting. This chocolate is gorgeous and I keep finding myself reaching for more. At just 25g, it’s a bit of a tease because it’s so seductive. It’s clear that a lot of thought and energy has gone into producing this chocolate, from selecting the beans for pairing to carefully refining it for the most intense flavour profile. This bar has attitude. They describe it as ‘gangsta’ on the packaging – I can’t think of a better word. I picked up this lovely book on a whim in my local independent book shop recently. It’s a really well-written account of the history of chocolate as we know it today, with the main focus being on the author’s family, the Cadburys. 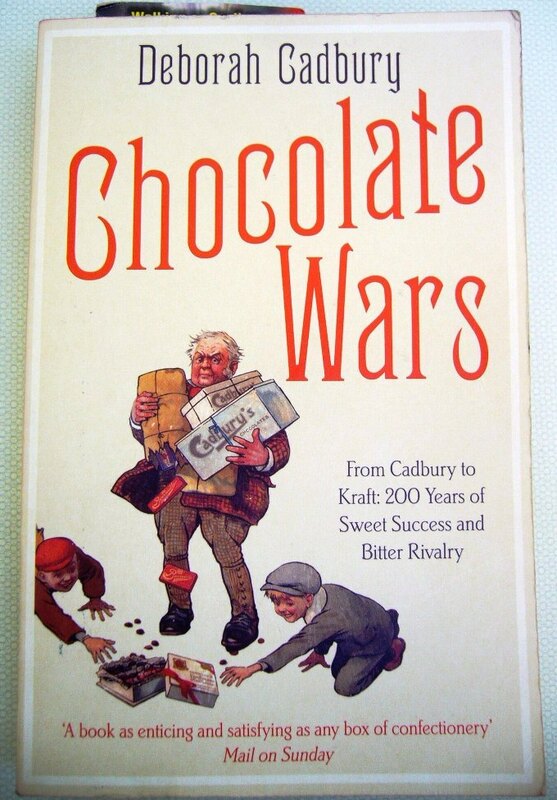 There is, however, a detailed and fascinating look at their rivals, setting the scene of the confectionery sector over the past 200 years – from Fry’s (once the largest chocolate company in the world) and Rowntrees to their foreign rivals; Peter, Mars, Hershey’s and Nestle. The book starts by introducing the founding father of the story, John Cadbury, a staunch Quaker whose values shaped not only Cadbury’s chocolate company, but the city of Birmingham and even the British welfare state. I felt his values and his voice haunting me throughout the book as I watched the spirit of Cadbury’s dramatically change over the years. I kept wondering what he would be thinking as at each turning point, new decisions steered the company in ever more commercial directions and away from its roots as a means of improving the welfare of the community. We get a fantastic account of the progression of chocolate, from the early 1800s, when it was drunk as cocoa (and mixed with all manner of additives, including potato flour and even red lead by the more unscrupulous vendors), all the way through to the challenge of developing a palatable milk chocolate. The book’s title refers to the evolving competition for the consumer’s cash by the major chocolate companies, the ensuing innovation that followed, leading to the creation of many of the much-loved confections we still enjoy today. Just as interesting as the development of chocolate was the changing social landscape. We get insights into the UK’s city slums and the first study into working class poverty by Seebohm Rowntree, as well as the creation of utopian villages, pioneered by Richard and George Cadbury. The uglier side of chocolate is exposed as the book examines the Quaker fight against the slave trade, and it’s interesting to see the emerging importance of globalism right through the book. An enduring theme at the heart of the book looks at the moral conflicts faced by the Quakers, including when and how to work with their rivals (most of whom, in the early days, were all Quakers), how to move with the times and stay competitive while retaining their religious values, how to approach the war effort, and how best to do God’s work in the face of fierce criticism. The book ends on a melancholy note as it details the hostile takeover of the much-loved British company, Cadbury’s, by American giant Kraft. It laments the loss of a valued institution and the genuinely caring spirit fostered within the company over 150 years – all gone in a matter of weeks. Deborah Cadbury is an excellent storyteller with an engaging and dynamic writing style, easily bringing a whole host of colourful characters to life. Her book is a fitting tribute for all that her ancestors achieved for the UK.